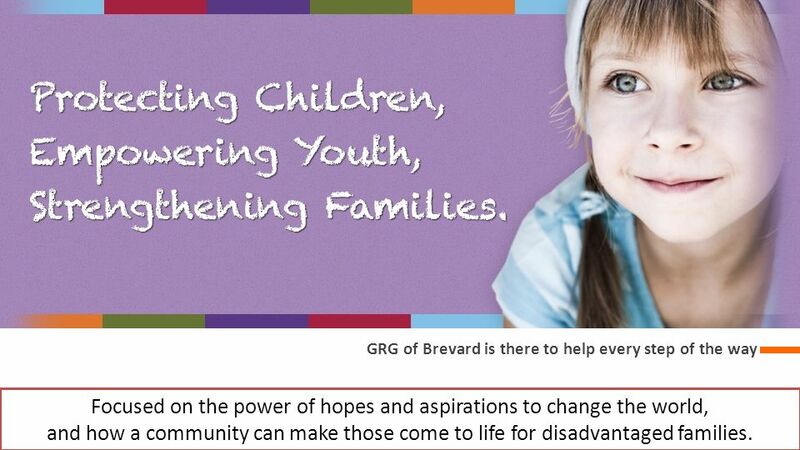 GRG’s mission is to provide advocacy, support, and referral to relative care families throughout Brevard County. 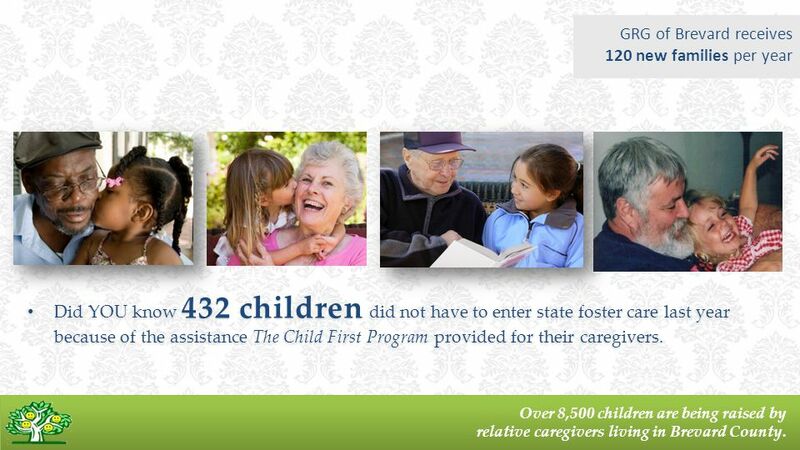 The Child First Program BREVARD COUNTY. 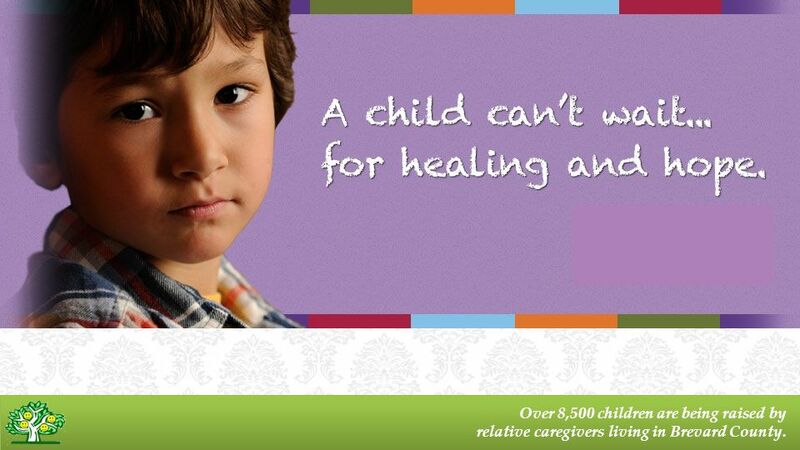 3 Over 8,500 children are being raised by relative caregivers living in Brevard County. 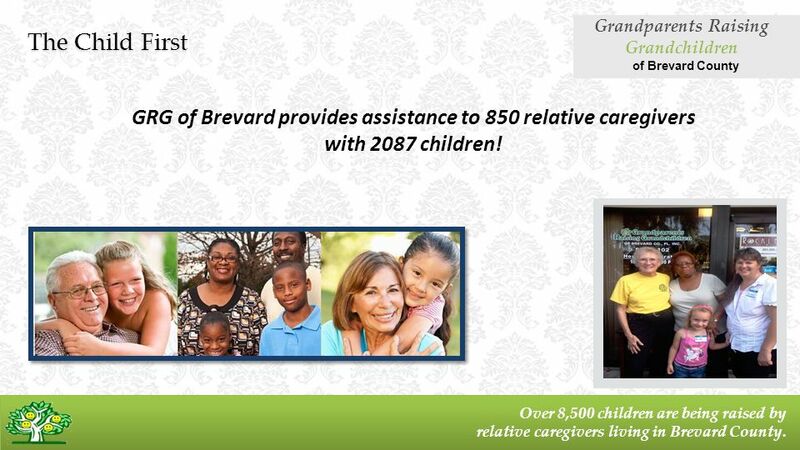 The Child First Grandparents Raising Grandchildren of Brevard County GRG of Brevard provides assistance to 850 relative caregivers with 2087 children! 6 Assistance to Grandparents taking on the new life role as Relative Caregivers GRG of Brevard is there to help every step of the way 1Advocacy&Resources 2 Support Groups & Target Training 3 Legal Assistance & Financial Stability Focused on the power of hopes and aspirations to change the world, and how a community can make those come to life for disadvantaged families. 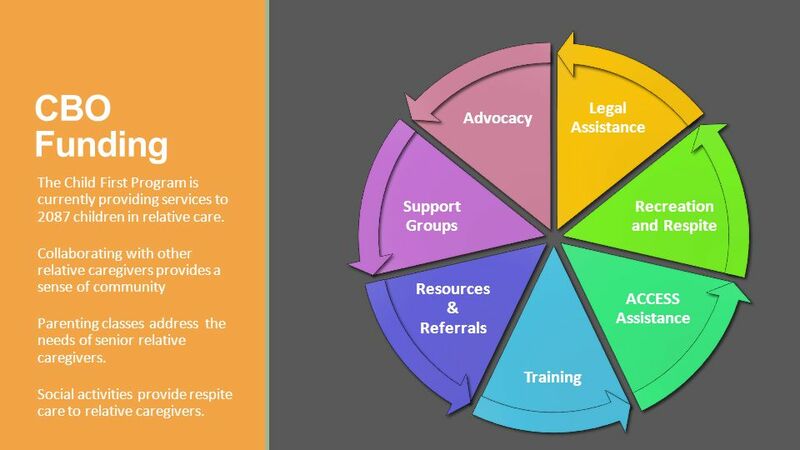 8 Legal Assistance Recreation and Respite ACCESS Assistance Training Resources & Referrals Support Groups Advocacy CBO Funding The Child First Program is currently providing services to 2087 children in relative care. Collaborating with other relative caregivers provides a sense of community Parenting classes address the needs of senior relative caregivers. Social activities provide respite care to relative caregivers. 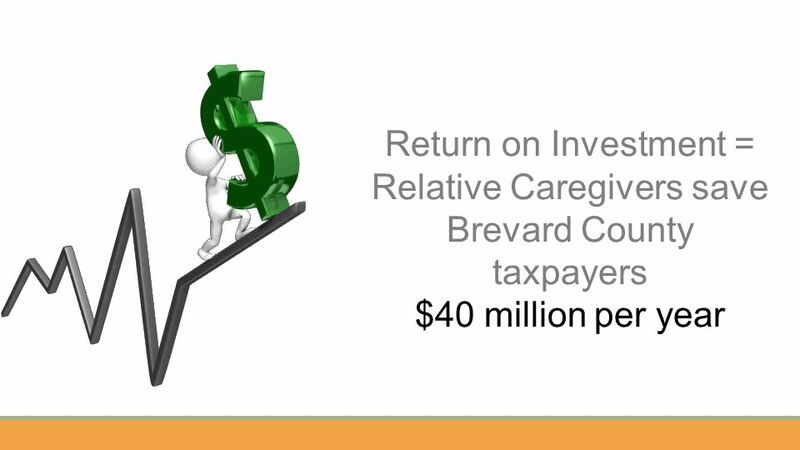 11 Over 8,500 children are being raised by relative caregivers living in Brevard County. 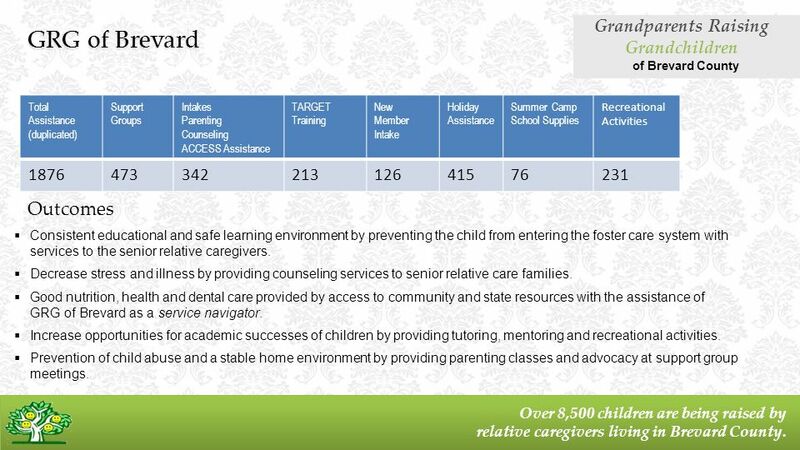 Total Assistance (duplicated) Support Groups Intakes Parenting Counseling ACCESS Assistance TARGET Training New Member Intake Holiday Assistance Summer Camp School Supplies Recreational Activities 187647334221312641576231 Outcomes GRG of Brevard Grandparents Raising Grandchildren of Brevard County  Consistent educational and safe learning environment by preventing the child from entering the foster care system with services to the senior relative caregivers.  Decrease stress and illness by providing counseling services to senior relative care families.  Good nutrition, health and dental care provided by access to community and state resources with the assistance of GRG of Brevard as a service navigator.  Increase opportunities for academic successes of children by providing tutoring, mentoring and recreational activities.  Prevention of child abuse and a stable home environment by providing parenting classes and advocacy at support group meetings. 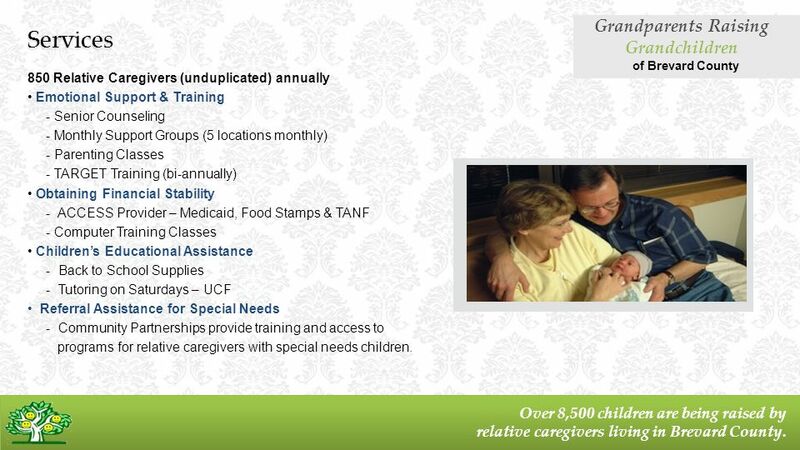 Download ppt "GRG’s mission is to provide advocacy, support, and referral to relative care families throughout Brevard County. 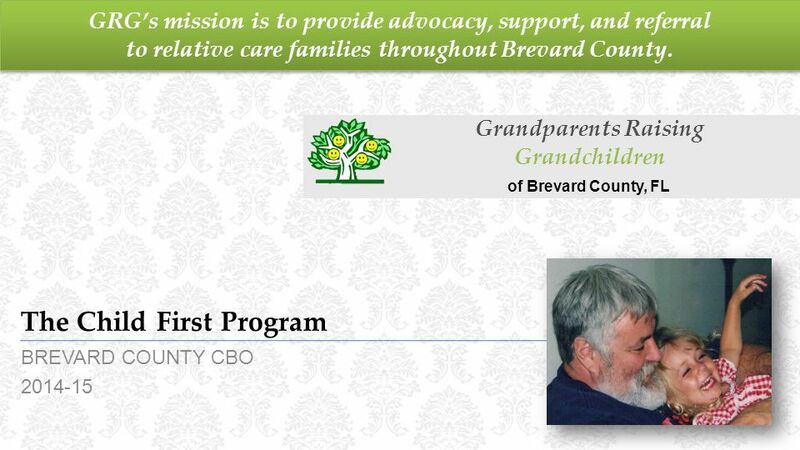 The Child First Program BREVARD COUNTY." Wilson County Department of Social Services Success in School NC Committee on Dropout Prevention. DHR-DFCS Statewide Community Forum Atlanta, Georgia December 19, 2006. Building Bridges to Self Sufficiency in Northwest Oregon Since 1966. United Way of Volusia-Flagler Counties Campaign Presentation. A Community Action Agency. About CEO CEO was founded in 1965 as the Community Action Agency serving Rensselaer County CEO’s mission is to preserve and. Grandparents Parenting Again Looking Back, Moving Forward. Joint Finance Committee Hearing Fiscal Year 2016 Renee Beaman Division Director Thursday, February 26, 2015 Department of Health and Social Services Division. Leading Collaborations to Change Lives. Leading Collaborations to Change Lives. Jessica Hernandez California State University of Long Beach School of Social Work May 2012. [LOGO] CAMPAIGN FOR CHILDREN Our children are our future. Join our campaign to invest in our children and our future. 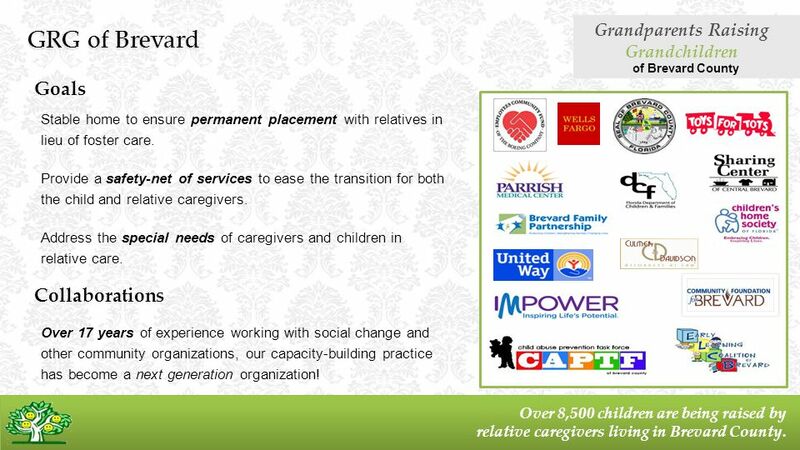 Janet Carlson, Ph.D.5/18/20151 FAMILY RESOURCE CENTERS Generally located in home-like settings, family resource centers serve as informal meeting places. July 9, Current. 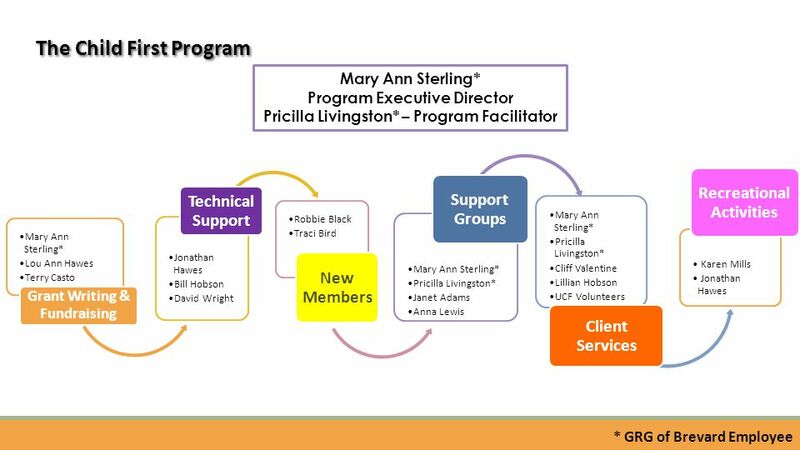  County initially funded part time coordinator  State funding began paying for full time agent and part time coordinator. Get Ready to Live United! United Way of the Quad Cities Area. 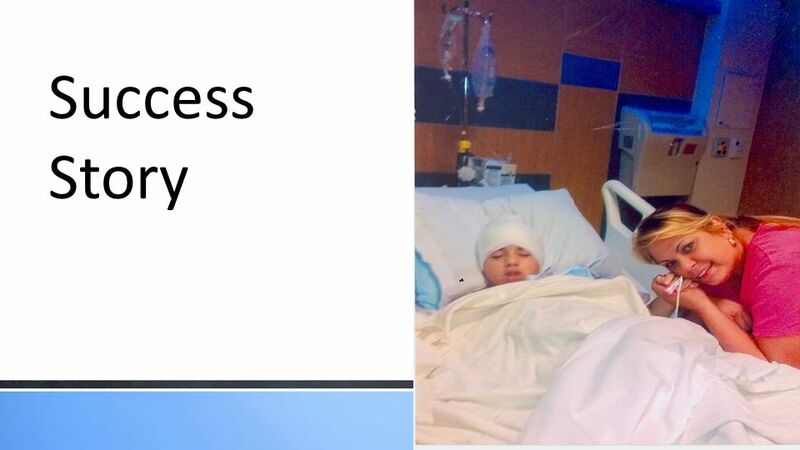 1 Lessons Learned about the Service Array from the First Round of Child and Family Services Reviews (CFSRs) The Service Array Process National Child Welfare. Shared Family Care: An Innovative Model for Supporting & Restoring Families through Community Partnerships Amy Price, Associate Director National Abandoned.